like I said yesterday, wedding stuff is like crack for bloggers. I must warn you that if all goes according to plan, this series includes five posts -- six if you include yesterday's wedding post. It's a wedding blog-feast! There's a lot to get to, so... on with the show! ** Disclaimer: Unfortunately, I did not start blogging until months after the wedding, so I do not have step-by-step photos to show you. However, I consider my DIY Wedding series more of a showcase than tutorial library. Still, I hope you enjoy what I have to share! I printed the seating arrangements on parchment paper. Mr. TBS singed the edges to create a weathered look. I bought this white backless frame at Michaels (with yet another 40% off coupon). Using a glue gun, we added lines of twine to hang the pieces of paper from using clothes pins. It was simple, and it fit our theme. This is another versatile project. In fact, Jamie at one of my absolute favorite blogs, The Letter 4, posted about this same project a few days ago as a way to display her daughter's hair accessories! We own a lot of books, and we knew that a wedding guest book, no matter how beautiful, would collect dust on a shelf. So we took a cue from my sister and brother-in-law and used a framed photo instead. 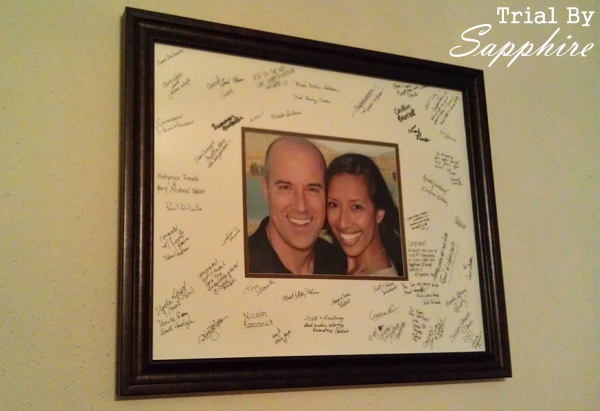 I bought a frame with wide matting from Michaels (with a 40% off coupon) and framed one of our engagement pictures. Now we have a beautiful reminder of our wedding day and the love of our friends and family to wake up to every morning! This idea could be used for any milestone -- graduation, baby shower, or a farewell gift for a co-worker! 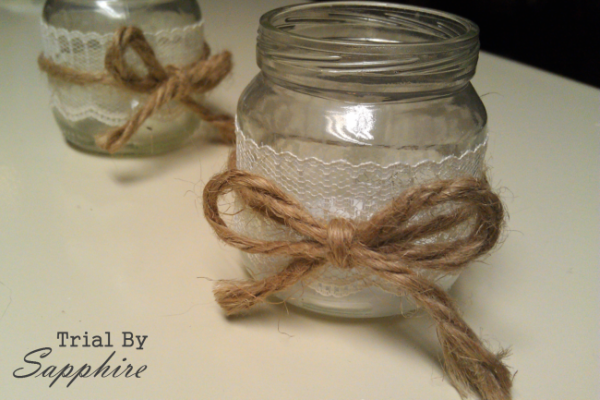 Votive candle holders: Baby food jars decorated with lace and twine. What would you use these projects for? 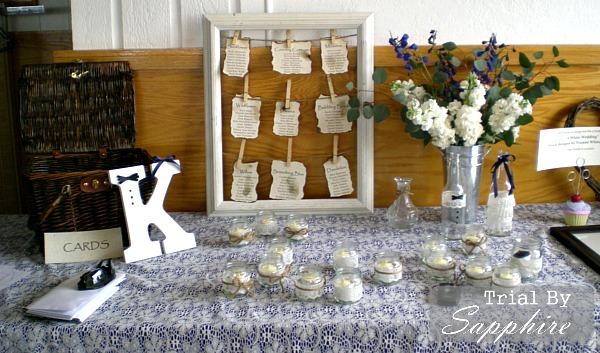 Did you DIY any part of your wedding? All of this is gorgeous! I absolutely adore the little baby food jars with lace & twine. So romantic. And that seating arrangement frame - awesome!! Nice job doll! I am a huge fan of the signed frame photo. I used a map because we had a destination wedding - but are huge travelers. But the engagement photo looks gorgeous. I also like those jars. Ugh this makes me want to plan a wedding again. You are right. Wedding talk is exactly like crack. Well what i think crack would be like. I, too, used the 40% off Michael's coupons like they were going out of style! Made multiple trips to use multiple coupons. 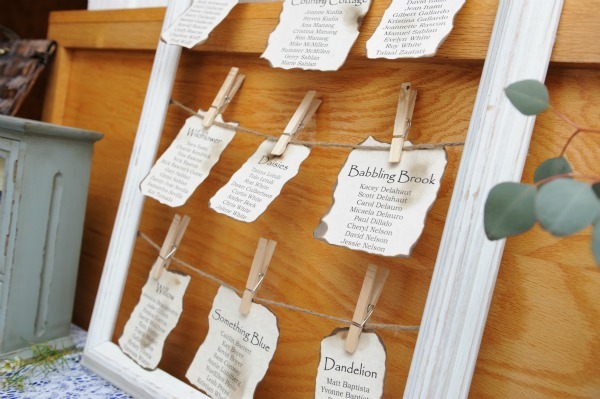 Good to see lots of DIY wedding examples. The peeps who spend bazillions on their weddings are smoking the crack pipe. OH this so so cute! Love the table! I mean you really cant go wrong with an open frame!!! and 40% off… DUH thats how us crafty blog girl roll!!! The candles! I AM LOVING THOSE! I can't believe they are baby food jars..who woulda thought?! And I absolutely love the first picture - you have the best smile, Linds! You have such beautiful ideas! I love that seating arrangement frame. We had a very DIY wedding too. It cut our costs down to super cheap, but it definitely took a lot more planning on our part! Just found your blog from Along the Way with V & J! Your blog is so cute! 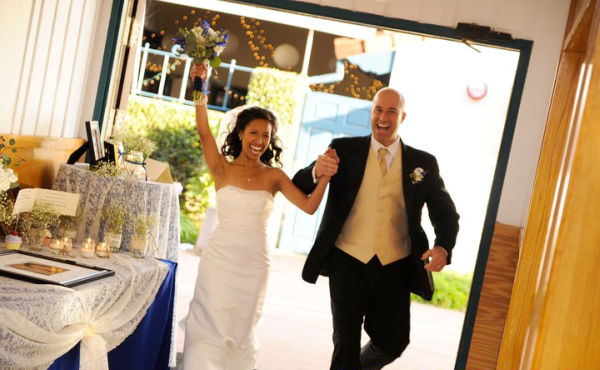 You can definitely link up your old wedding posts too! They don't have to be from that particular day! Would love for you to participate - your wedding looks beautiful!! Visiting from I blog 4 me. I love the candles and the matted photo frame - I have seen the signed matte many times before, and I think it's awesome.